For the latest Official Chamonix Snow Report: Click on PLAYLIST > Scorll down to the latest video and click!!! As in all mountainous regions the weather can be quite unpredictable. 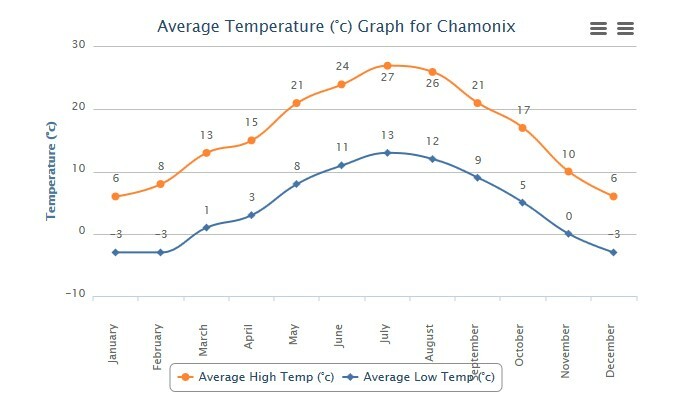 However Chamonix is one of the few 'snow sure' locations in Europe, having an excellent snow report during the majority of the Winter season. In Summer the temperature rises significantly so its comfortable to sun bathe, visit one of the many lakes and put your feet up (Lake Passy is our favourite), or go for a hike either up in the high mountains or on one of the many walking trails along the valley floor. Even in the Summer Chamonix normally gets a period of rain at some stage so always pack a waterproof no matter what time of year you choose to visit us.